In the year-and-a-half since Apple released the last version of its intermediate video editor Final Cut Express HD 3.5 ( ), a couple of big events have disrupted the state of editing video on the Mac. For one, the digital camcorder field has shifted steadily away from tape-based cameras to models that record to high-capacity memory cards, mini-DVDs, or built-in hard disks. The switch isn’t just a matter of capacity, however; those devices record to different formats than the standard DV used by most tape camcorders. Until now Final Cut Express hasn’t been able to read them. Another event—this one surprising—was the August release of iMovie ’08 ( ). The revamped version of Apple’s digital video editor was stripped of many of the features that made iMovie HD 6 bump up against the high end of intermediate editing. For many Mac editors, iMovie HD 6 was capable enough to not move up to the added cost and complexity of Final Cut Express. But with iMovie ’08 targeting a more entry-level audience, some video hobbyists may wonder if they should apply the skills they honed in iMovie toward something more sophisticated. The $199 Final Cut Express 4 addresses these two events directly. 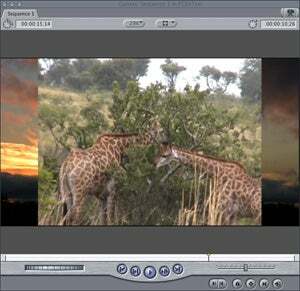 The updated software ably tackles the format issue with support for importing AVCHD and HDV footage, while actively courting the iMovie camp by announcing itself as not just an alternative to editing in iMovie ’08, but as the missing next step—in conjunction with the convenience of iMovie—that offers the control that iMovie HD editors enjoyed. The footage captured in AVCHD (Advanced Video Codec High Definition) is not bound by the linearity of video recorded to tape; clips are saved to empty blocks on the surface of the memory. To fit more than a few minutes’ worth of footage onto a memory card or disc, the formats are highly compressed, requiring a conversion to a more editable format. Review and import AVCHD and MPEG footage from tapeless camcorders in the Log and Transfer window. When you connect a tapeless camcorder to your Mac, Final Cut Express’s new Log and Transfer window lists the available clips in a column to the left, with a preview area at right to preview the clips and assign In and Out points before importing. What’s great about this approach is that it comes close to overcoming one traditional Apple-imposed limitation on Final Cut Express, the capability to mark the sections of clips you wanted to import and then process them in a batch, as Final Cut Pro allows you to do. Adding media to the queue starts importing right away, but you can continue to review, mark, and add other clips while importing is under way. (You can also pause the import and start it later when your Mac isn’t busy working on other things.) Unfortunately, the feature applies only to the Log and Transfer window, and not the Capture window, so we’re still stuck with importing one clip at a time from tape. As with Final Cut Pro 6 and iMovie ’08, Final Cut Express 4 transcodes AVCHD footage into Apple Intermediate Codec (AIC), so importing takes longer than real time. In an earlier version of this story, I erroneously wrote that Final Cut Express 4 imports MPEG-2 footage, when in fact the formats supported are DV, HDV, and AVCHD. Owners of camcorders that record video to tapeless storage in MPEG-2 format can use iMovie ’08 to import that footage, and then import the video from there. According to Apple, Final Cut Express 4 will play MPEG-2 footage in the Timeline in Unlimited RT mode without rendering, but with the possibility of degraded playback performance. Final Cut Express has always inherited features from Final Cut Pro, and a welcome addition to version 4 is the mixed format timeline. The program still asks you to specify a project’s format, such as DV-NTSC or variants of HDV (High Definition Video), but adding a clip of a different format as the first clip in the sequence changes that preference. Final Cut Express HD 3.5 mixed formats, but at the same resolution (left). Version 4 scales footage of different formats to fill the screen (right). In this case, the widescreen high-definition clip appears at the edges because the DV footage in front was shot with a standard 4:3 aspect ratio. When you add a clip with a different format to the timeline, Final Cut Express 4 scales it to match the project’s setting. You could mix and mingle formats in version 3.0 and higher, but they would appear at their native resolutions and be mismatched. Missing from the Final Cut Express 4 package is Apple’s Soundtrack application, as is the option to Export for Soundtrack. According to Dion Scoppettuolo, Apple’s Final Cut Express product manager, users turned to GarageBand for the same features. With more than 50 new FxPlug plug-ins, there are even more possibilities for cluttering up your video. However, it’s not all gratuitous effects—image controls such as HSV Adjust, for example, give you more control over the appearance of your footage. With the added capability of importing iMovie ’08 projects, Apple is obviously positioning Final Cut Express 4 as the next editing step for people who want more than what iMovie offers (and who probably aren’t interested in jumping between iMovie ’08 and iMovie HD 6, which Apple made available for free to iLife ’08 owners ). The iMovie integration is cleaner than in the past (Final Cut Express HD could open iMovie HD projects directly), which turns out to be a benefit. Think of iMovie ’08 as the place where you store all of your digital footage and cut together a quick rough version of your movie. (Don’t get carried away—audio clips, titles, Ken Burns effects, cropping, and video adjustments don’t carry over, and any transitions are converted to cross dissolves in Final Cut.) Then share the movie as Final Cut XML. In Final Cut Express, choose File -> Import -> Final Cut XML from iMovie (note the specific shout-out) and build from there. As long as you stick with the importing limitations, the leap between iMovie and Final Cut Express is straightforward. People who prefer iMovie HD 6 over iMovie ’08 find themselves in the same quandary as when iMovie ’08 debuted, however. Moving one’s knowledge from iMovie HD to Final Cut Express still requires a leap in terms of how Final Cut prefers to operate; surprisingly, though, those who cut their teeth (and video) on iMovie HD are likely to feel more comfortable in Final Cut Express because of the old iMovie’s use of a conventional timeline versus the more free-form approach in iMovie ’08. Also, Final Cut Express costs significantly more than iMovie (especially if it was free as part of a new Mac purchase), even though Apple has addressed the price issue by dropping the cost to $199. That’s still real money, but on the edge of what someone who has decided it’s time to move up is probably willing to pay. I’ll take a more extensive look at Final Cut Express 4 in my review of the updated software—that review will appear soon at Macworld.com. This article was reposted at 9:40 p.m. ET on November 28 to correct information about the MPEG-2 format.